Gorgeous Statement Hair Jewellery for the bride-to-be! If you were under the impression that bridal hair accessories are limited to the age-old maang tikka, matha patti or passa, then we are here to prove your wrong! From maang tikka with tassels, royal head chains to statement side tikka, the bridal hair accessories today have upped their game! The right hair accessories can completely transform your bridal look with that little oomph factor! This bejewelled royal courtesan look where a necklace or a maang tika is used to embellish the bridal plait had to be first on our list. It looks so regal and stunning at the same time. Doesn't it look divine? Wreath or a floral tiara (as you call it) used to be a western wedding affair some time ago! Well, they’ve totally taken over the mehendi and haldi scenes in the Indian weddings by now! We love this bride’s statement wreath and how she has matched the colours of the flowers to her lehenga. We are having a really hard time to take our eyes off this chunky head-chain piece the bride is seen wearing! It’ll make for a great statement bridal hair accessory to wear at your mehendi, sangeet or cocktail function. What do you think? Once associated only with the Muslim weddings, the jhoomer or paasa is now a hot and trending bridal accessory. 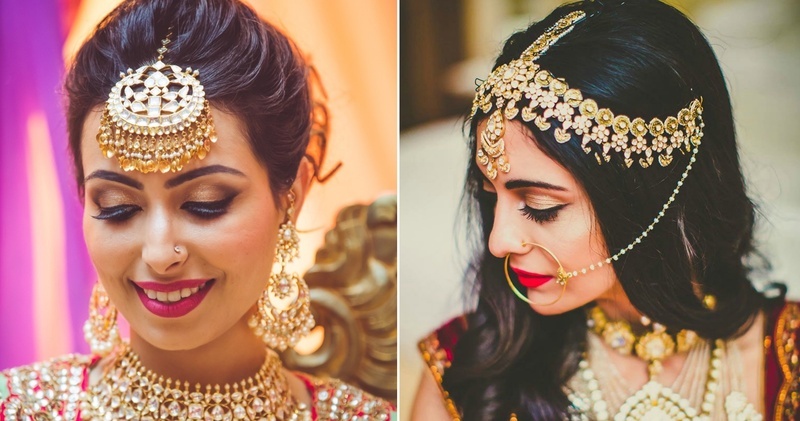 You can opt to wear only a paasa on the side or team it up with a Maang-tikka to get the complete bridal look. Worn either ways, we feel it adds a regal old-world charm to the bridal look! Bejewelled, beaded or plain-simple, these bridal headpieces look totally chic! You can add a maang-tikka in the centre or wear it just the way it is, the choice is all yours! Don’t these dainty floral pins look too adorable! Get the ones with kundan, little petals or ghungroos which will take your bridal hairdo up a notch for your haldi or mehendi functions! Now this juda-pin needed a shout-out of its own! So cool! Looking for something cute yet traditional to wear at your mehendi, cocktail or sangeet? Then this Zardosi headband from Sabyasachi might be just what you're looking for! These come with hair combs that you can put on either side of your hair - they are refreshingly different and look gorgeous! So, did you decide which accessory is going to make it’s way in your your bridal hairdo? Whichever one you pick, just make sure it allows you to be fuss free & comfortable during the whole event!